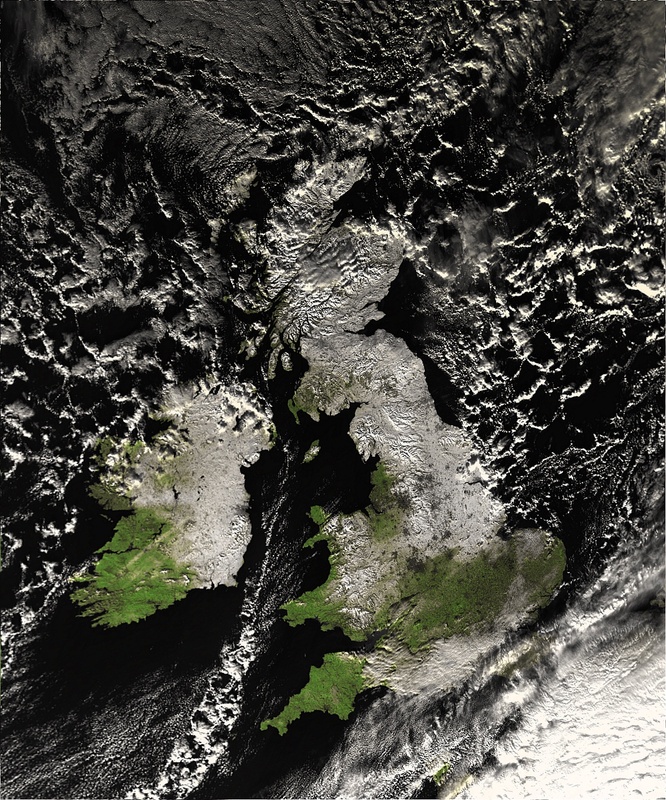 MODIS data processed to display vegetation, post-processed to compensate for the low winter light levels. 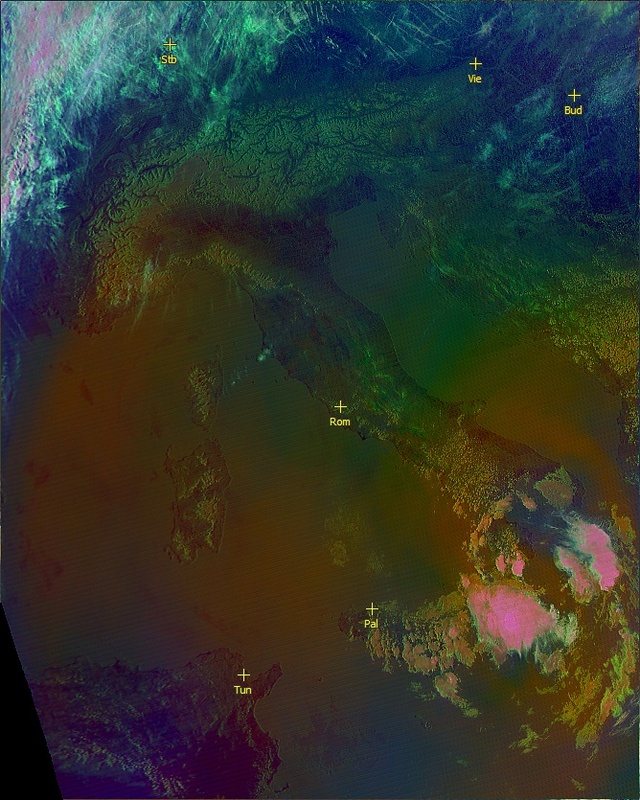 The MODIS L1 Viewer allows you to visualise either image or fire data from the MODIS satellites (Aqua and Terra) from the Internet or the 1km resolution data sent over the EUMETCast system (you will need to register with EUMETSAT to get this additional data, but it is free). My MSG Data Manager program is recommended to copy the EUMETCast data into a date-named directory tree and manage the removal of older data. The MODIS data is sent in 5-minute segments, and the program allows you to combine multiple 5-minute segments from the same pass to produce a larger regional image. Both the raw data, and several derived false-colour images are available. 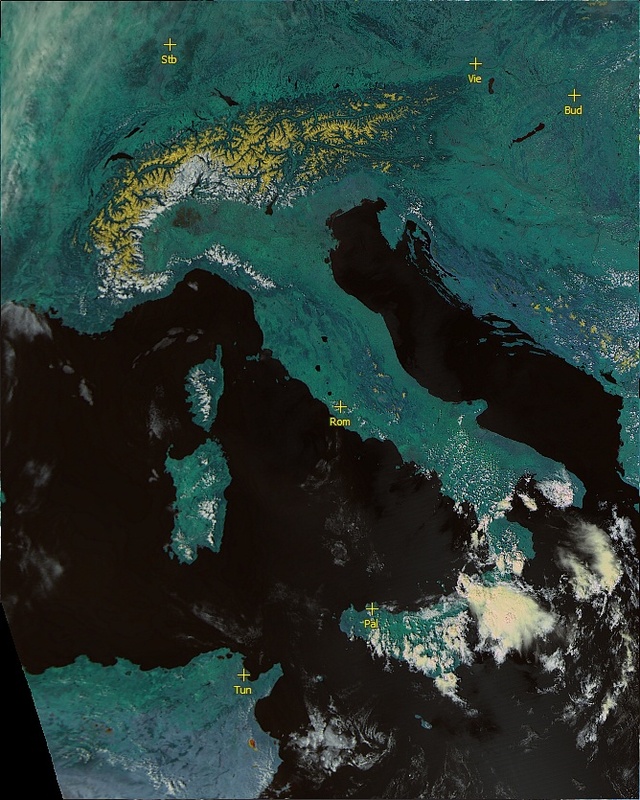 From the MODIS L1 Viewer version 3, you can also use 250m, 500m or 1km resolution data downloaded from other site, and you can can produce your own false-colour combinations from either visible or thermal bands. Because of the much larger size of this data (up to 44 Megapixels and greater), image combining is done in your own image progressing program. 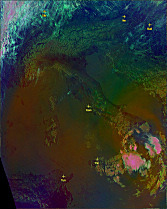 Here is an example of LAADS data at 500m resolution, which contains the seven visible bands sensed by the MODIS imager. 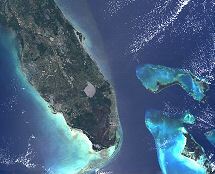 James Brown has kindly provided this example of false-colour combination using band 1, 3 and 4 to illustrate the features of the seas around Florida. Click the thumbnail for a larger image. The Browser tab provides a graphical display of all the data available for a particular date, allowing easy selection of a segment to be processed. Ascending and descending passes are shown in different colours, each labelled with the time of the segment. Double-click a segment to open it for further viewing. You can also display the user-defined regions to which data can be remapped. Select the date and time either with a calendar control, a "today" button, or by stepping day-by-day. The Browser View allows you to select multiple images from the same pass for processing as a combined pass covering more of the Earth's surface. You can drag-and-drop file from Windows Explorer onto the Browser tab. 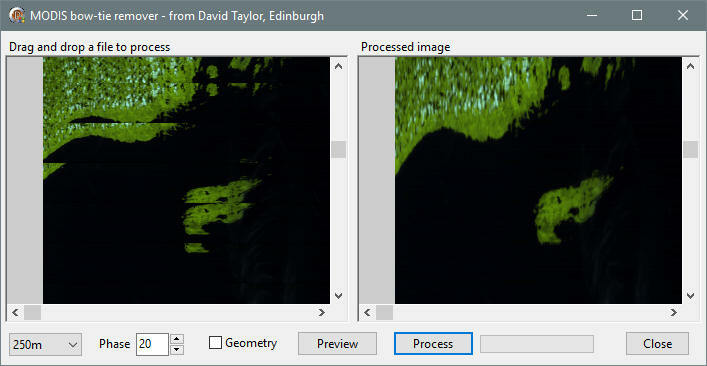 Once you have selected one or more segments for processing, the Raw Images tab is where the data is first displayed. There is a Geo tab to show the region covered by the pass in more detail, and a number of tabs allowing access to one of the 18 - yes, eighteen - sensor channels available from MODIS. There are 36 channels from the sensor itself, of which 18 are available on the EUMETCast subset. All channels are included in the LAADS 1km resolution downloads. Select a user-defined region to which to remap the data. Change the brightness of a visible-channel image. Save the displayed image, either with or without horizontal geometric correction. 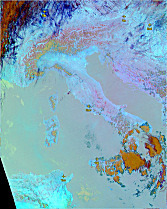 RGB - colouring resembling the classic RGB421 display from NOAA AVHRR data. RGB521 - experimental colouring to bring out snow. Vegetation - vegetation index derived from channels 1 and 2, with the vegetation coloured green. Air mass - derived from the thermal channels to show bulk atmospheric characteristics. Ash - derived form thermal channels processed to emphasise ash and dust. Also shows aircraft trails as dark lines. User-defined visible and thermal channel combinations. Similar right-click options are available. Here are some sample images, with even the large images shown at 2km resolution. The MODIS L1 Viewer allows you to interpolate the images down to 250m resolution, 64-times greater than the images shown. Click any image for a larger view. Even higher resolution is possible with LAADS data, the program offering down to 125m resolution on user-selected regions. 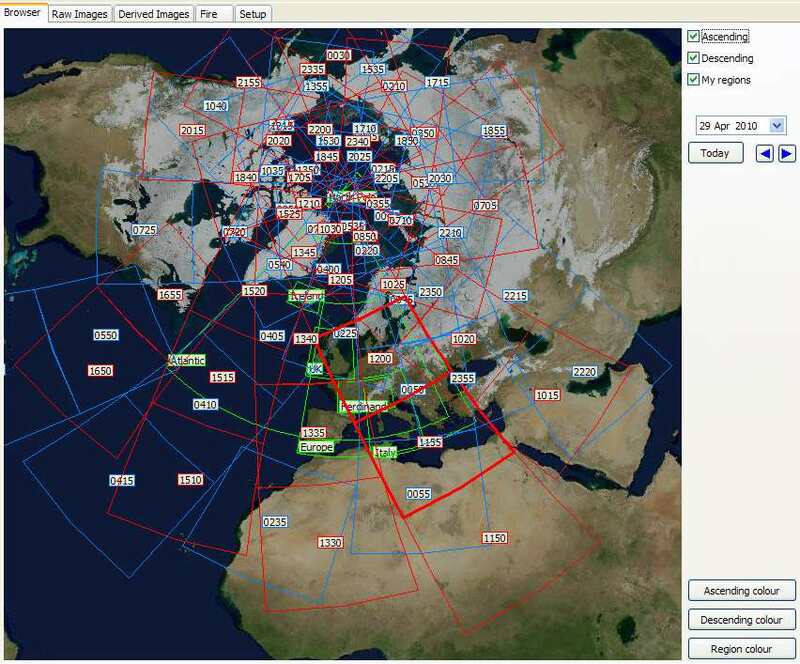 Allows for display of MODIS fire data - files sent on data channel 12 with names like: MOD14.A2010214.0115.hdf. You can right-click the images to change the displayed area. 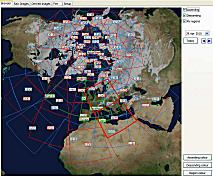 The various setup options allow the selection of boundary data and its colour, definition of the regions for remapping, and various processing and image save options. The program includes a 30-day trial licence period to allow you to evaluate its function. After the 30-day period, you will need to register to continue running the program. Registration also entitles you to technical support. Register the MODIS L1 Viewer here. Add support for 250m, 500m & 1km resolution LAADS data (allows use of world-wide data you download from this site, extend File|Open dialog to include LAADS file names, support drag-drop of one or more LAADS files, support files on the command-line), user-selected RGB support for combining visible or thermal channels (10 settings), add reading a whole directory of fire files parameter: -fire:<directory-name> (supports many command-line options, plots cities, background image named FireBackground.jpg supported), option for world map view in browser, option to bypass new file scanning on startup, setup option for EUMETCast channels or all channels - a program restart is required, support for GSHHS 2.2 and MapGen boundary data, add support for local boundary data which is specified by the environment variable BOUNDARY_DATA, substantial command line enhancements being developed. Support mouse wheel to scroll the images, more warnings when some channels not present, area acceptance limits for batch mode (values from Setup or batch-commanded region number, data-deficient passes not saved), recognise 250m and 500m files in batch mode, improved support for orthographic projection in northern regions, where large longitude spans are needed, some protection against non-HDF files, correct 125m scaling. Improved choice of multi-segment pass direction when both ascending and descending are in the set, add experimental blue-bias option in user-RGB mode - proof of concept, avoid browsing hidden directories. Add two Internet pass-browsing sites in new View menu, add choice of line widths for coarse & fine boundaries, recognise directory with no trailing "\" as parameter, enhancements to allow derived views when multiple chunks have both IR-only and IR/Vis channels (available on visible channels in raw view and on derived views including vegetation), French language update. Add German language option, press Shift|Today to inhibit browsing, add -BOUNDARIES command-line option when saving an image from the command-line, make saving of near-empty remapped images optional, enhanced in-region check for partial images. If you don't have a MODIS L1 Viewer 4 key, contact me for a fresh licence key before using this software. Note that this program will not run on Windows 2000. Ton Lindemann's volcanoes database - you can use this like a cities file. The exact location for the received data may be different for your system. Note that if you are running the earlier AR-Soft RAMdisk, you will need to uninstall it (run the install program and select the uninstall function), and install the Dataram RAMdisk software instead. The exact location for the received data may be different for your system. This will also provide the AIDA-1 and TAMSAT data if you have requested these. If the received data for channel 4 is in the "received" directory tree as shown above, the only change in the MSG Data Manager will be to got to Setup, Channel Selection, Other-2, and in the MODIS L1/L2 data box, check both Manage MODIS L1/L1 and Copy M02 sensor files. You may also like to set a value for the Data retention box to non-zero so that the MODIS data can be automatically deleted after a certain number of days. 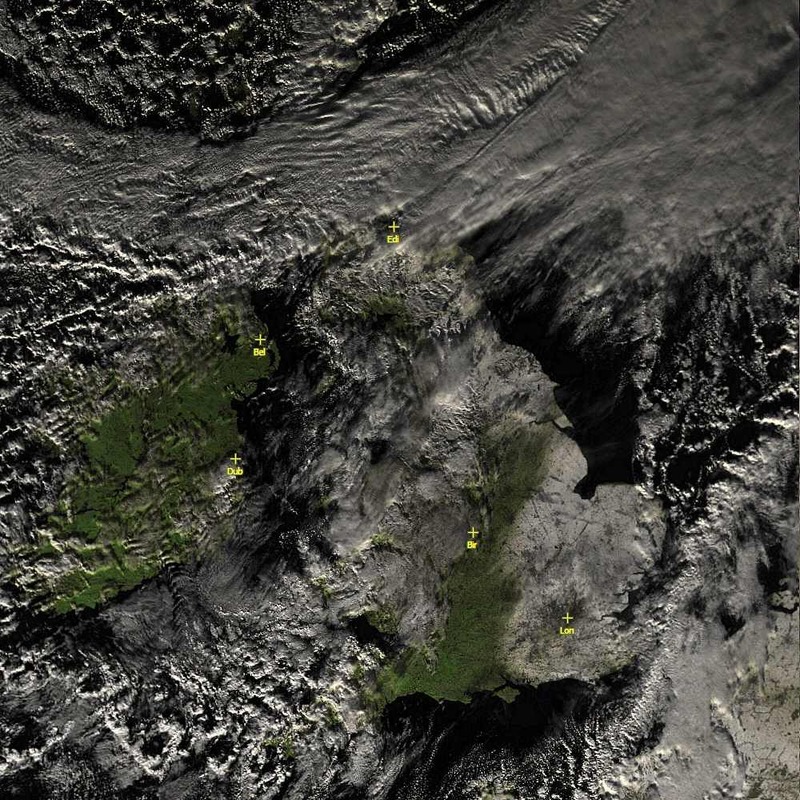 If you have downloaded MODIS images from the Web site, you may have noticed that there is an apparent duplication of data at the edge of the image, and that the images are not corrected for the variation in resolution between the centre and edge of the image. To correct these defects, I offer the unsupported Defrag MODIS program. The snows of early December 2010 when, on Monday December 6th, much of Central Scotland was brought to a halt by heavy snow showers, on top of previous snow compacted to ice. Temperatures were not above freezing for days before and after. Here the Vegetation mode of the program has been used, together with the the brightness adjustment for vegetation added in beta 1.0.5.83. 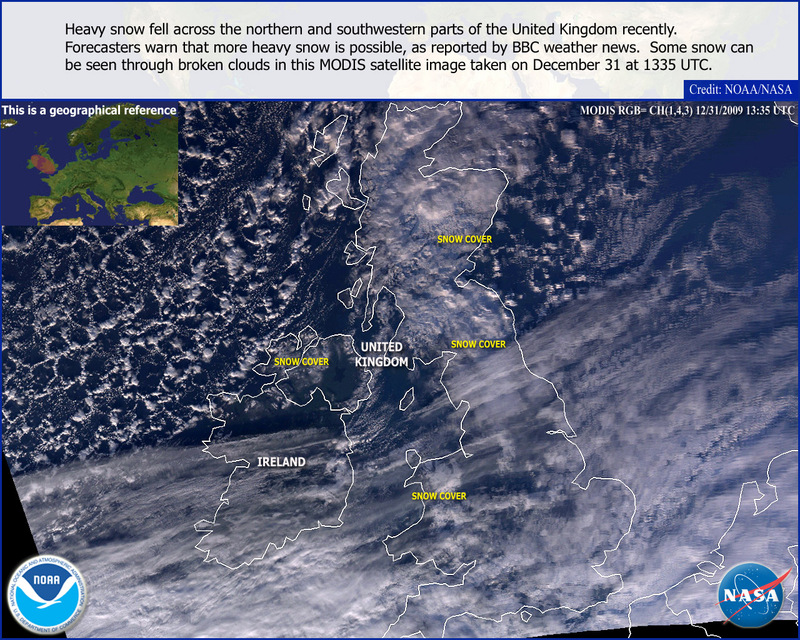 Here's another image from Wednesday, 2010 December 08 - both images copyright 2010 NOAA/NASA/EUMETSAT etc. Here is an example of the program processing multiple thermal channels of data to highlight the volcanic ash from the eruption of Eyjafjallajokull in Iceland in Spring 2010. 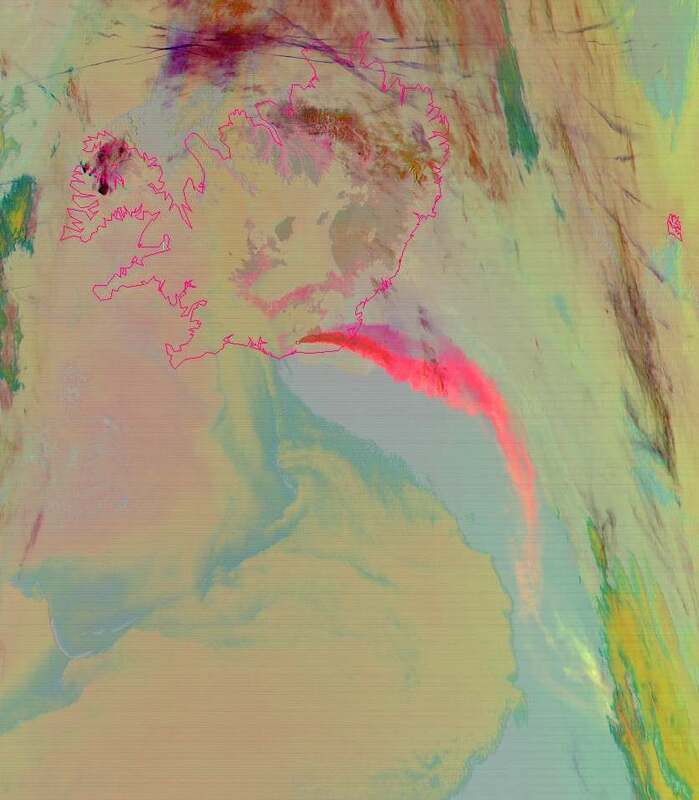 The ash shows as a bright pink band in the image below, and you can also see aircraft "contrails" in a darker grey colour to the north of Iceland. Note that the colour can vary according to the nature and concentration of the ahs, so use care when interpreting such an image. This image is one of many you can find on James Brown's splendid Ash Web page. 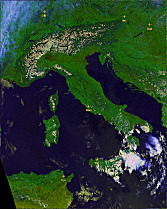 © EUMETSAT (2010). This MODIS image was taken 0410 on Thursday May 6th 2010 - click for more like this. 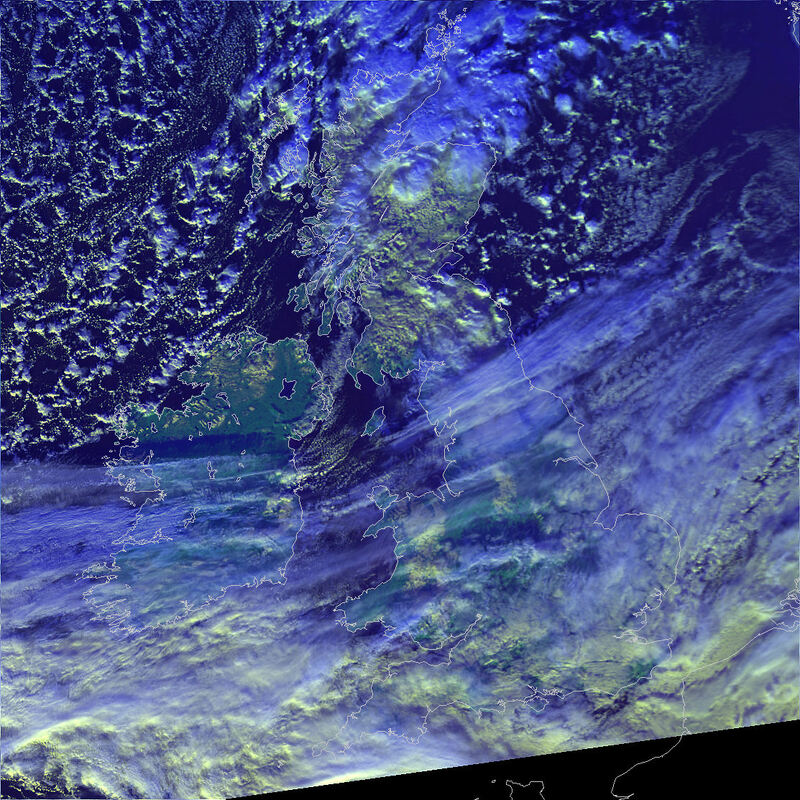 The MODIS L1 Viewer can also process data downloaded from the Internet, which gives you access to world-wide data, at higher resolutions than are available over EUMETCast (500m and 250m). 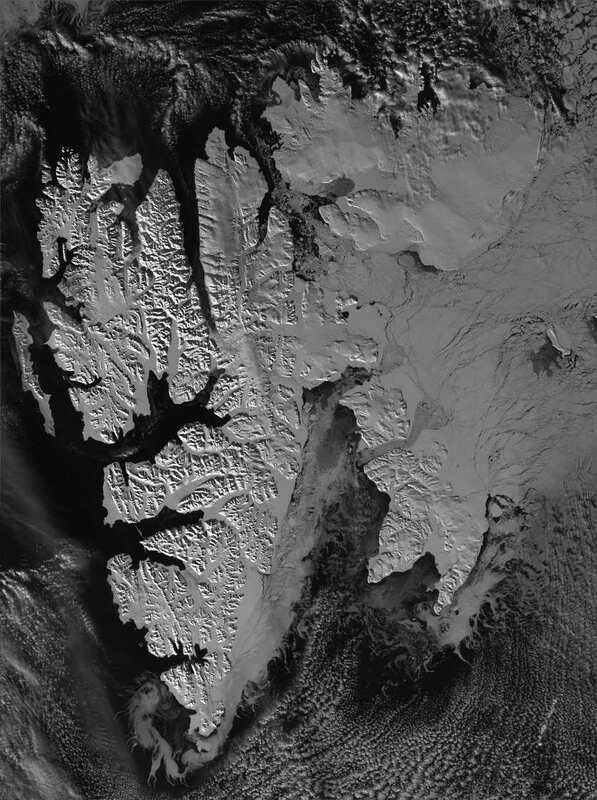 I was alerted by a stunning ENVISAT image from Peter Burden in the GEO Quarterly journal (GEO-Q 34 p.30) that Svalbard was particularly clear on 2012-Mar-25, so I downloaded the 250m resolution data from the 12:30 segment from the LAADS site, and processed it to an interpolated 125m resolution in the viewer. Here's the result. Click on the "thumbnail" image below to get the full resolution image - it's 1.1 MB even with JPEG compression! Of course you can set these parameters just as you wish to suit your own needs. After loading HDF file, I selected Raw Images, channel 2 in the Viewer, and then right-clicked the image and selected the Remap region, Svalbard option. I felt that the image looked best with the right-click, Vis. ch brightness, Dark option selected, but again that can be personal taste. 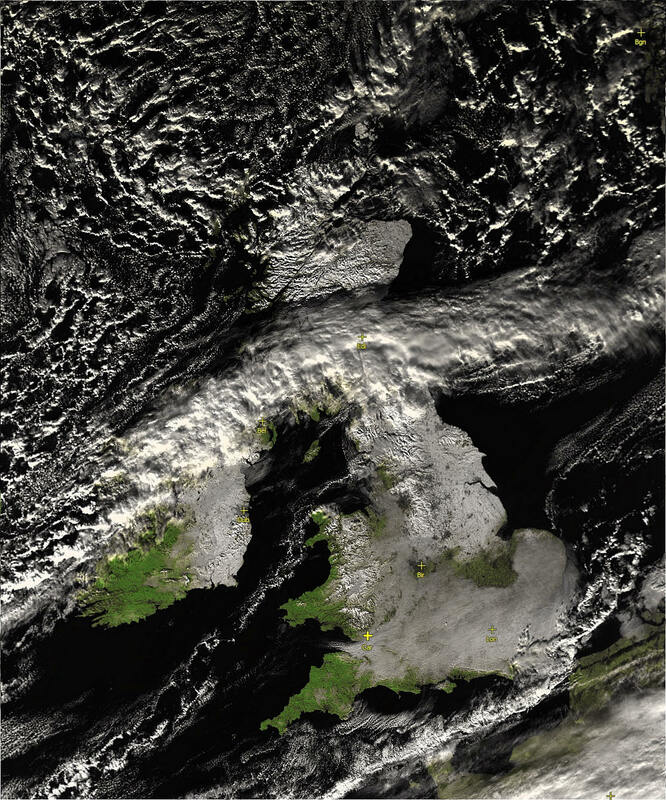 Note how the built-in "butterfly wing removal" renders the clouds in the North Sea without the banding in NOAA's image, allowing better observation of the detail, and how the choice of channels differs between the photo realism of the NOAA image, but the greater land detail of the MODIS L1 Viewer image. Data from EUMETSAT as part of the trial service.